Pole position, fastest lap of the weekend and 4th and 6th places finishes in front of the International GT paddock were the highlights of a hugely successful event at Brands Hatch last weekend. 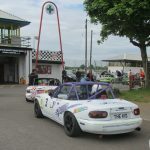 The massively competitive and exciting BRSCC Mazda MX 5 championship didn’t disappoint by serving up another set of action packed races with Ben front and centre of the action, and when the dust settled Ben Tuck found himself moving up to 3rd in the Championship. Rounds 3 & 4 of the Championship were run on the iconic Brands Hatch GP circuit in support of the prestigious Blancpain International GT Sprint series. During testing Ben shared the track with the Ferrari’s, Lamborghini’s, Bentley’s and Aston Martins of the worlds top GT teams and drivers. Bens team pulled out all the stops to set the car up and cure the suspension problems that plagued his performance at Silverstone in Rounds 1 & 2. Qualifying was to be a huge challenge, most of the grid had never turned a wheel on the GP circuit before as the packed itinerary meant that early practice was dropped. Despite the challenges, Ben blitzed the session topping the timing sheets even after having a huge slide through the Druids hairpin. The pole position was a perfect reward for the hard work, preparation, focus and Bens growing confidence. 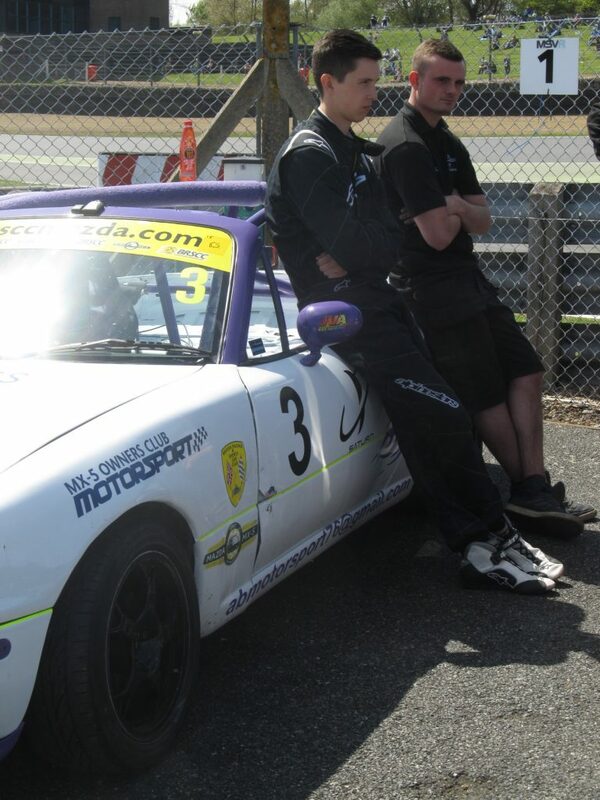 It was only 8 race events ago that Ben started his first ever qualifying session in motor racing and went on to out-qualify both his team mates. The pressure was on to convert the pole into a result and for Ben that meant he was going to have to battle hard against the decades of experience of the top 5 drivers, with little more than 6 months of his own. 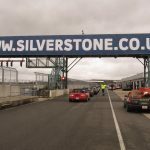 The lights went out for Race 1 and Ben took off followed by 38 MX 5 racers and what followed was one of the classic MX 5 races of recent years. No quarter was given and the top 5 shared the lead several times, with yellow flags and spins punctuating the action. The fastest laps of the top 5 were all within 1 tenth of a second. As the pack sped across the line Ben took 4th spot just loosing the podium place only a matter of yards from the line and claiming 2nd fastest lap, falling short of fastest by 5 thousandths of a second. Encouraged by the race pace of his Mazda and spurred on by the tantalising proximity of a win, Ben lined up for race 2 in 4th ready to take the fight to competition. Race 2 proved to be equally as exciting as race 1 as Ben fought hard for the top spot. As the fighting continued to the line Ben took 6th position but this time topped the fastest lap sheet almost 2 tenths of a second faster than the race winner and claiming fastest lap of the weekend. In just 10 months Ben has progressed from a complete novice into the Championship’s fastest driver and has turned his rookie season into a realistic Championship title bid. The attention gathered for his sponsors has been beyond all expectations and Ben’s fresh, young and professional perspective means that he is regularly interviewed by TV crews. Ben has proved that he can learn fast and waste no time in maximising any opportunities coming his way. His phenomenal progress in just a few races demonstrates his massive potential. With a realistic financial backing Ben is guaranteed to perform at the very top of his field and 2015 will be the year that Ben proves his worth. Ben is now looking for investment to propel him onto higher levels of racing and can offer a wide range of exclusive benefits to partners and sponsors, including exclusive access to races, corporate hospitality and events, driving tuition, coaching and motivational training.